Rangers’ William Hill Scottish Cup tie at Cowdenbeath has been postponed. The Fife club confirmed the news on Twitter less than three hours before the fourth-round clash was due to kick-off. The Central Park pitch was frozen and the game has been rescheduled for Wednesday January 30. Local referee Scott Millar is understood to have made the decision after being called in for a late pitch inspection. Cowden secretary David Allan said: “We put the covers on the pitch on Wednesday but the problem was there was a big gale which lifted a couple of the sheets off and exposed two or three areas to the cold. “We put the covers back on but the areas exposed are the side of the pitch which does not get much sun. We did various things today to ensure the pitch was playable but there are two areas which are just too hard. 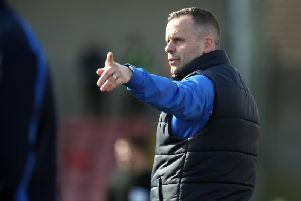 Cowdenbeath boss Gary Bollan was “annoyed” with the decision, which came after the Scottish Football Association insisted on a pitch inspection. Bollan said: “We’re frustrated and disappointed as we’ve prepared all week for this. To get to this late stage on the Friday night right before the game and so close to kick-off is massively disappointing. “We’re annoyed as well. At this moment in time, just under three hours before kick-off, the area in the corner is touch and go. It’s firm but I wouldn’t say it’s dangerous as such.